I’m back with another kitchen project! Seriously, that mood board I put together was the best inspiration! I’m going to put one together for every room project from now on. I love being able to see all of my ideas together before I actually start buying and DIY-ing! 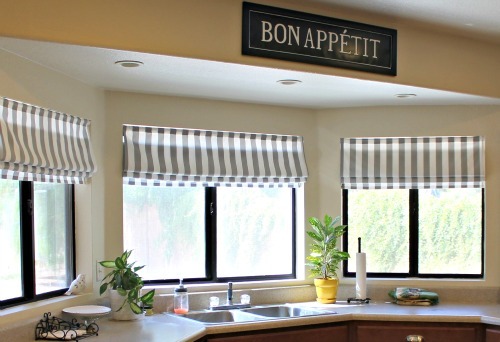 I you might remember that last year I made faux roman shades for my kitchen windows. I still love the fabric (although my boyfriend hates it), but I didn’t like the fabric with my new canisters and design plan for the kitchen. 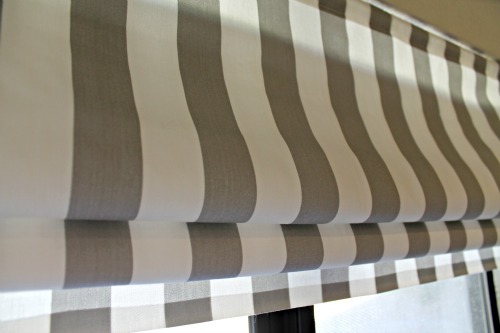 So, I decided to replace the bold fabric with a more neutral gray and white striped fabric. I found this one for $7.50/yard. I ordered a swatch and loved it in person, so I ordered 4 yards. I asked my boyfriend what he thought of the fabric and he said “It’s better than that ugly stuff that’s up now.” So we’ll call that a win! 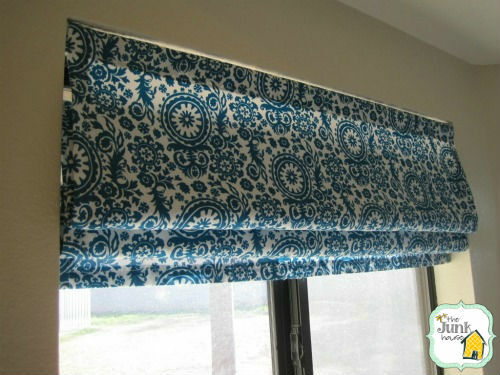 I used iron-on hem tape to “sew” the sides and bottom of the shades. However, I did sew the top rod pocket because I thought it would hold better and last longer. I used the same tension rod method as before, so this ended up being a pretty quick update. 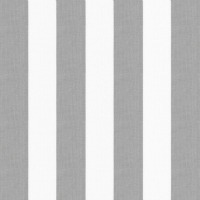 For detailed iron-on hem tape instructions, check out YHL’s step by step post here. My only advice would be to make sure the steam is off and make sure you don’t iron the tape too much – it makes it hard and won’t stick correctly. I love them and I’m so happy with my kitchen progress! 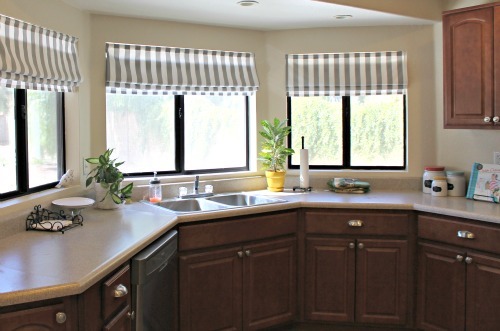 I hope you aren’t sick of seeing my kitchen because my other 2 posts scheduled for this week are also kitchen projects. 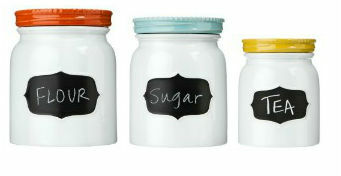 Those look great with the canisters! I don't know if you can now that they are made, but your windows would look bigger if you placed the shades just below the ceiling and had them hang just into the top of the window. Love anything that looks that great & doesn't involve sewing! I love the stripes. They look great! They look really good, I liked the old ones too, but these definitely go better with your cannister choice. I'm not sure I'd have been able to bring myself to ditch the old ones having slaved over them though! Everything looks awesome! Great job! Can't wait to see what you do next!